Barrons Educational Series, 9781438007717, 264pp. With Barron’s, learning chemistry becomes fun. In Painless Chemistry, students will see how the Periodic Table of Elements offers the key to understanding chemistry, discover many of nature’s surprises, explore atomic theory, chemical bonding, the structure of molecules, and more. 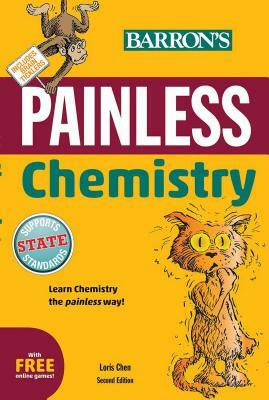 Geared toward middle school– and high school–level learners, Painless Chemistry takes a lighthearted, humorous approach to learning chemistry and is ideal for students who find the subject confusing, or who just need a little extra help. Students can test their learning progress with quizzes and “Brain Ticklers”, plus additional games online, including Beat the Clock, a line match game, and a word scramble. The authors' main goal is to clear up confusion and pique interest by emphasizing the intriguing and often exciting ways in which students can put each subject to practical use.